VICOM has announced the introduction of the TWS-1000 photonics alignment system from EXFO Burleigh Products Group, a manufacturer of high precision electro-optical and piezoelectric-based products for optical test and measurement and sub-micron linear positioning applications. 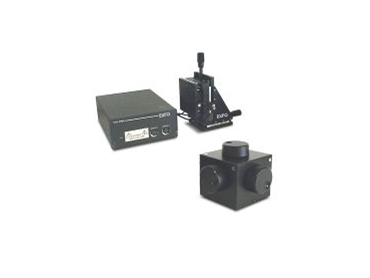 Designed for high-precision photonics alignment applications, the new TWS-1000 is suitable for R&D and low-volume production as well as teaching institutions that require state-of-the-art equipment without the high price traditionally associated with such products. Demonstrated for the first time at the Optical Fibre Communication (OFC) conference in Atlanta, Georgia during March, the TWS-1000 is the latest innovative tool developed by EXFO for alignment, testing and bonding of optical components. * 150μm piezoelectric (PZT) technology for accurate alignment over long distances. * 60nm resolution for maximum coupling efficiency. * Long travel manual stages (XYZ) for coarse positioning. * Up to 12 degrees of freedom, depending on configuration, for maximum versatility. The TWS-1000 was designed to be easy to use and adaptable to a wide range of assembly applications including; PLCs, transceivers, ball lens, butterfly packages and a host of other opto-electronic components. The new TWS-1000 photonics alignment system can be configured to meet a wide variety of customer requirements and budgets. Vicom claims it's the most cost-effective solution available today for high-precision, low-volume nano-alignment and is suited for volume ramp-up and process optimisation of new optical components.